Welcome to Napkin Folding Guide. Here’s the excellent Pyramid Napkin Fold. This classy napkin folding technique is simple, fast, and can be made easily with most napkins. This classy napkin folding technique is simple, fast, and can be made easily with most napkins. If the napkin being used is thin and flops easily then iron it with light starch prior to folding and it will turn out perfectly! 3. Rotate the napkin so the open end faces away from you. 4. Fold the right end up to meet the far corner, ensuring the edge of this new fold lays on the centerline as shown. 5. Repeat the last step with the left side, folding the left tip up to the far corner, creating a diamond shape with a seam running down the center. 6. Turn the napkin over, keeping the open end facing away from you. 7. 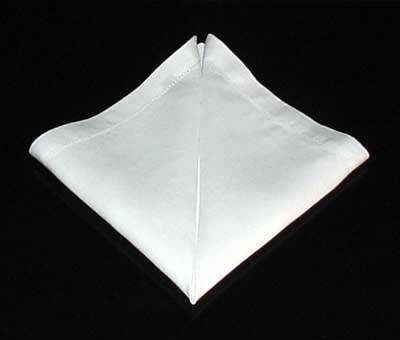 Fold the napkin in half by bringing the farthest point of the diamond up and back to the nearest point. 8. Turn the napkin over again, this time keeping the open end facing towards you. 9. Fold the napkin along the center seam and you have a neat, sturdy pyramid. If your napkin won’t stand neatly then you may need a little starch.